Take this fabulous 7 night cruise onboard Costa Deliziosa. Boarding in Dubai you visit Muscat, Fujairah, Abu Dhabi and Bahrain. Designed to fascinate, but also to satisfy every desire, Costa Deliziosa – the new diamond of the fleet – has been created to offer a unique sensory experience. Every detail on board the Costa Deliziosa is dedicated to the pleasure of the guests on board: from the furniture to the art collections, or the grand spa area to the mastery of the great chefs. Dubai - undoubtedly the pearl of the United Arab Emirates. Its name belongs not only to one of the seven emirates but also to the largest city of that emirate (Dubai City). It is situated on the Persian Gulf, southwest of Sharjah and northeast of the capital. Spend the first day exploring the city. Why not visit a souk or be in awe of the Palm Islands. 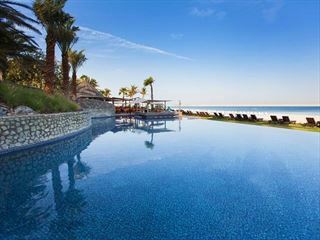 Dubai - Spend the day on the beach relaxing. Return to the ship for dinner and drinks in the evening. Bahrain - The archipelago of Bahrain, situated near the east coast of the Arabian Peninsula consists of around thirty islands in the Persian Gulf, mainly made up of sand banks and coral reefs. Today you can visit the Al-Fatih mosque, the largest in Bahrain. It can be visited by non muslims. 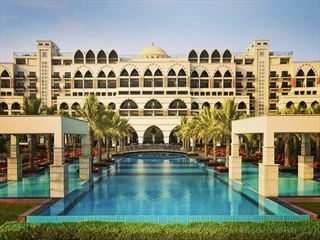 Abu Dhabi - The United Arab Emirates is certainly one of the richest countries in the world. Oil has made the fortune of this sovereign state, independent since 1971 and composed of seven emirates: Abu Dhabi, Dubai, Sharjah, Ajman, Umm al-Qaiwain, Ras al-Khaimah and Fujairah. The union is governed by a Supreme Council formed by the seven emirs, each of whom is sovereign in his own territory. Well worth a visit is the Al Hosn Palace, known as the Old Fort, fish market and the old souk. Fujairah - The city itself boasts a museum that houses archaeological and ethnographic exhibitions, an almost spooky old quarter and a 300-year-old fort. You will also find time to do some shopping: typical local crafts include gold and silver jewellery, carpets and fabrics. In the bazaars you will find Western products such as hi-fis, computers and cameras at very competitive prices. Muscat - Muscat is the capital of Oman and one of the oldest cities in the Middle East, dating back to the 2nd century.